The new content for Far Cry 4, Valley of the Yetis, will be out on March 10th has announced Ubisoft. Players will take control of Ajay after the helicopter crash on a Himalayan ridge. Then, they'll have to capture a camp and guard it from a mysterious cult and beware of yetis lurking in the shadows. Oh man, you should. Its incredibly fun. Yup, there were a lot of times where I just went to do a sidequest and had a blast. So much freedom of choice in both how you choose to get to a place and how you choose to complete the mission, really amazing stuff. Next up: Good PC performance DLC? Nah, I guess that is too low priority! 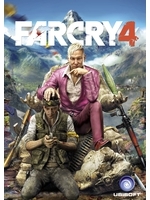 far cry 4 was easily my game of the year and probably my fav game so far this generation. It's really packed with great fun in every corner of the game. the exploration, side quests etc are all great fun. The story isn't crazy strong but it's easily good enough to create a setting for a VERY fun world to play around in. I can't wait to see what they have for the 5th game.